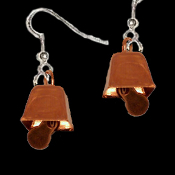 COWBELL EARRINGS - Mini Bovine Dairy Farm Moo-Juice Milk Farmer Costume Jewelry - Realistic Copper color miniature metal dimensional charms, approx. 3/8-inch (9mm) diameter. Whimsical tiny cow bells really tinkle, jingle, jangle, & actually ring when you move... Ring-a-ling-ling til the cows come home!! !